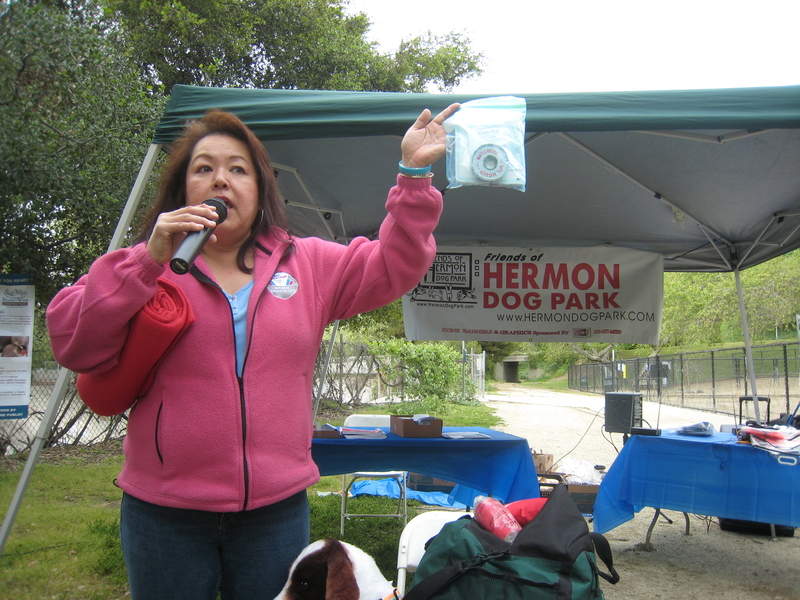 “Are You Prepared With Your Pets When Disaster Strikes?” Friends of Hermon Dog Park sponsored a free Pet Education seminar at the Hermon Dog Park on February 23, 2014. Two experts, Cynthia Sanchez, Red Cross Pet First Aid Instructor and Level 3 CERT trained, as well as Thea Martin, Pet Disaster Planning Instructor, provided hand-outs, emergency checklists and answers to your questions. Topics covered included: What to do if the shelters won’t take pets? How do we keep our pets safe? How to approach injured pets. What supplies are really needed? We had a drawing for prizes and the usual doggie snacks and information at our booth. Seating was provided by Councilmember Jose Huizar of CD-14. Download the flyer here and check out photos on our FaceBook page. The 69th Northeast Los Angeles Holiday Parade officially brought in the holiday season on Sunday, December 1, 2013. The Friends of Hermon Dog Park once again marched as the “Santa Paws Squad” with people and dogs dressed in holiday attire along side marching bands, drill teams, dancers, musicians, floats, equestrian units, celebrities and community representatives. 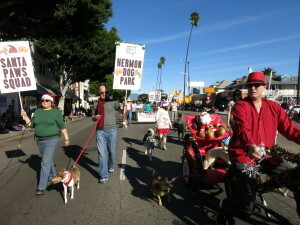 This year we had our own “float” – a fabulous sleigh powered by a bicyclist and two talented pooches. We had wonderful volunteers carrying and banners and one lucky participant won our raffle prize of a Petco gift card. Thanks to everyone who participated! You can check out Santa Paws Squad photos on our Facebook page and this year there was even a video made about us at the parade.